Many diseases can have an impact upon oral health and/or the safe delivery of dental care. Consequently, oral health care providers need to be comfortable with assessing the risk of providing dental care to their patients with systemic disease as well as the evaluation of oral conditions that may represent manifestations or consequences of systemic disease. Risk Assessment and Oral Diagnostics in Clinical Dentistry aims to enable the dental practitioner to comfortably and capably assess when medical conditions may impact dental care and diagnose oral conditions using routine testing modalities. 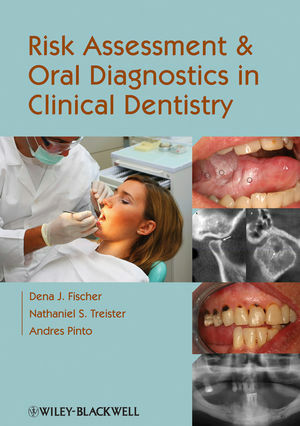 This clinical guide contains succinct and detailed text with visual aids regarding how to obtain and perform diagnostic tests, how to interpret these tests, and the implications of tests results upon the management of medically complex dental patients and patients with oral conditions. Color photographs show conditions, testing equipment, and test results. An appendix highlights the ten most common oral medicine disorders encountered in dental practice. Dena Fischer, DDS, MSD, MS, is Assistant Professor, Oral Medicine and Diagnostic Sciences at the University of Illinois at Chicago College of Dentistry. Nathaniel Treister, DMD, DMSc, is Assistant Professor, Department of Oral Medicine, Infection and Immunity, at the Harvard School of Dental Medicine and is Associate Surgeon at Brigham and Women's Hospital in Boston. Andres Pinto, DMD, MPH, FDS, RCSEd, is Associate Professor, Department of Oral Medicine, at the University of Pennsylvania School of Dental Medicine and Attending Physician at the Division of Oral Medicine at the University of Pennsylvania Medical Center in Philadelphia.